For people who are interested in the pre-history of automata here is a link to a fascinating article by Elly Truitt whose dissertation I have previously mentioned on this blog. Given below is an excerpt from the article. 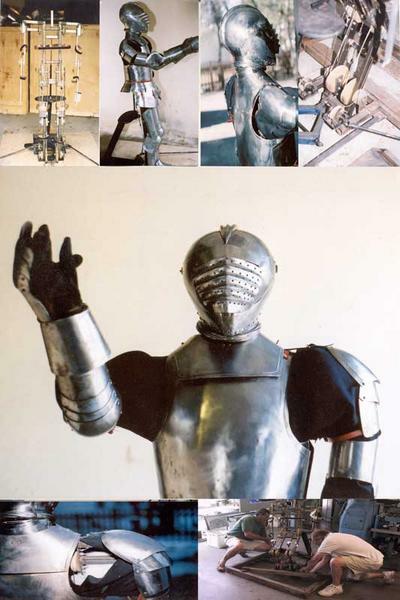 What is more remarkable than the presence of these metal people in this romance is the fact that automata in human form were found frequently in the pages of twelfth-century French romances—copper knights and damsels, golden archers, children, and guardians of tombs. The early twelfth-century chanson de geste Le voyage de Charlemagne contains a description of the emperor of Constantinople’s palace, upon which two golden children blow ivory horns and laugh in a lifelike manner when the wind blows. In Le roman d’Eneas, written around 1160, a metal archer ensures that the sanctity of Camille’s mausoleum remains inviolate. Another midtwelfth-century romance, Le conte de Floire et Blancheflor, mentions the speaking, moving statues of the eponymous lovers erected on Blancheflor’s mock tomb. The Roman d’Alexandre, completed around 1180, features two golden youths, made by augury (par augure) and enchantment (enchantement), armed with maces, guarding a drawbridge. In addition, two copper boys, armed with shields and pikes and made by enchantment (enchant) guard the tomb of the emir of Babylon. The First Continuation of Chrétien’s Perceval, completed in the first decade of the thirteenth century, has two figures guarding the tent of Alardin, an “Eastern” potentate, who can discern knight from churl and maiden from nonvirgin, and then bar the entrances of the latter to the tent.